George Foreman is at again, introducing a new grill rightfully deemed the Evolve Grill! I’ve owned 2 George Foreman grills over the last few years and they really do come in handy when you need to A) watch your calorie/fat intake, B) make a quick dinner or C) run out of propane in your outside grill (yes I have turned to my George Foreman Grill on a number of occasions because of this reason)! Although there are many features that I loved about my prior George Foreman grills, I was never too fond of the cleaning process involved with them. The new Evolve Grill changes all of that and really changes the entire idea of cooking with an indoor grill! Cross-hatch grill plates – Perfect for grilling chicken breasts, fresh fish and more. Mini-Burger plate – Serve up low-fat turkey sliders in minutes. Griddle plate – Cook up breakfast, lunch or dinner without adding extra oil or butter for healthier meals. Cupcake/muffin plate – Whipping up six muffins or cupcakes is a snap with this easy-to-use plate. Panini plates – No need to butter bread when making panini in the George Foreman Evolve™ Grill. Deep-dish baking plate – From lasagna to veggie-packed casseroles, the deep-dish bake pan provides another versatile usage for the George Foreman Evolve™ Grill. Omelet plates – Flipping omelets used to require lots of butter or oil to prevent sticking, however, with the George Tough™ nonstick coating, making omelets is simpler and healthier than ever. Waffle plate –The waffle plates makes preparing golden, delicious waffles on the grill easy and convenient. The George Foreman Evolve Grill has quite literally “evolved” into the ultimate in-home grilling machine, allowing you to not only grill, but to bake, make panini’s, waffles, omelet’s, sliders and just about anything else you can wrap your brain around! Thanks to the Family Review Network, we were sent a George Foreman Evolve Grill to check out that included 2 grill plates, a baking dish, and a slider plate. The first feature I noticed was the digital time and temperature control that can be set with just a push of a button, a nice feature to custom set your cooking modes. The grill itself is not too big and not too small and features the George Tough™ nonstick coating for oil-free cooking. Although I have to say that my favorite feature, by far, is the removable and dishwasher-safe grilling plates! George Foreman has certainly “evolved” with the introduction of this new grill that also features a patented slope that can be engaged at anytime during cooking to ensure that all of those yucky fats drip right out! I must say, however, that I was a bit disappointed that our grill did not include a recipe book. I would have loved to see a recipe book with a number of unique recipe ideas and pictures, however, I did find many recipes by visiting the Healthy Cooking Blog. 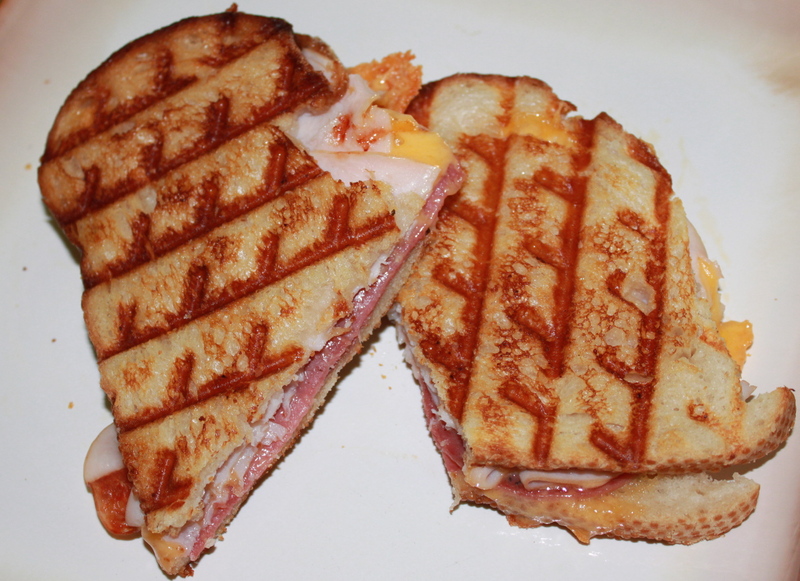 Although we have already used the George Foreman Evolve Grill many time since we recieved it last week, I made some amazing panini’s for lunch a few days ago that I want to share with you! Heat the George Foreman Evolve Grill to 400 deg. Place one piece of buttered/garlic bread on the grill. Add turkey, salami, and cheese and finish off with the second piece of bread. Close the Evolve Grill and cook until golden brown or about 4 minutes. Cut and serve! Variations of the Panini Club Melt include ham, bacon and toppings such as lettuce, tomato, onions etc. You can also find the George Foreman Evolve Grill at great prices on Amazon. Currently the deal is just $49.99 Shipped. Click below for this discount deal! We’re big fans of the George Foreman Evolve Grill and we think you’ll be too! Visit www.georgeforemancooking.com to find an array of recipe ideas on the Healthy Cooking Blog! Disclaimer: This post was written for Family Review Network & George Foreman Healthy Cooking who provided the complimentary product in exchange for my honest review. My thoughts and opinions continue to remain my own! Our Third Wittlebee Box Has Arrived + Get 50% Off Your First Box + Free Shipping! Kids Bowl Free All Summer Long at Over 950 Locations & #Giveaway! I can’t wait until the muffin pan and the waffle plates come out. Checked at Kohls yesterday, and they don’t have them yet. Dontcha’ just love that little grill?!? We’ve been using ours like crazy too. I cooked chicken and paninis on mine so far. I especially LOVE that the plates are removable & dishwasher safe. That sounds like such easy clean-up! I love the George Foreman grills. I love the new models that have the removable plates the best. I have one and it works great. Night Owl mama´s last blog post ..WW- Rock Island Grand Prix Ready- Set- Go! I just got an Evolve grill too, and tried it out for the first time last night! I made lasagna last night, and I was actually going to make paninis for lunch today – great minds think alike! Can’t wait to try them after seeing your pic! Beeb Ashcroft´s last blog post ..Salonpas “Pain Free and Proud” Contest Plus Bonus Live Giveaway on Contest Corner Tomorrow Afternoon! I’ve been using (and loving) one of the smaller grills for almost ten years now. Will definitely look into one of these if it ever wears out on me. Thanks for the good reviews! I’ll be adding this to our list of applicances.